Setting up your own green pharmacy? Collect quality herbs is half success. The other half is their proper drying and storage. The basic rules for collecting herbs we read the article How and when to go for herbs . Now we look at how it is subsequently dried and stored. It is important to give the herbs to dry as soon as they collect, so we can ensure their best quality. The basket or bag in which we are saved when harvesting should not remain in a thick layer over an hour, to prevent them from evaporating and spoilage. The basis for proper drying herbs is well ventilated and dry habitats. Rooms are ideal type of soil, which is a constant circulation of air, but can be dry even in the living room. The room should not be too dusty, or otherwise contaminated. Kitchen, bathroom and other rooms with possible moisture and vapors are certainly not suitable dryer. Herbs can be dried outside but only in warm and dry weather, preferably in the shade. Drying in direct sunlight is not advisable for most plants, very easy to burn, turn black and lose their active ingredient. Plants should be dried thoroughly and as quickly as possible, because in humid or when there is a slow drying, evaporating, mold infestation, redness, and sometimes attacked by various pests. Herbs, which collect all the leaves or other parts long enough, it can bind to smaller flowers and hang up. We provide them with access of air from all sides, and save your work to their inversion. Leaves, flowers and roots are best dried on different grids, sieves, in smaller cardboard boxes, or other surface lined with a clean absorbent paper. 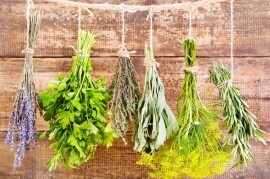 As should be dried herbs "horizontally", then always in a thin layer. We must not forget their frequent turning and aeration. Roots must be thoroughly cleaned before drying, wash immediately with clean water and dry cloth should be. Accelerate drying roots cut into smaller pieces or cutting a lengthwise. Flowers, leaves or other parts of the seedlings before drying Do not wash in water. Some plants or parts dry quickly, such as nettle leaf, others, such as dandelion root slowly. Nesušit or dry in the oven? If we have favorable conditions or space for natural drying, we can use special dryers or ovens to food. Using these and similar sources of heat but it is especially important to follow the set temperature and watch the drying time to catch our burns. Recommended temperature drying oven and dryers may vary among species and parts of plants vary widely recommended temperature is around 30'C, in most cases should not exceed 40'C. Some sources indicate the possibility of drying in a microwave oven, some herbalists absolutely reject it again. Personally, I microwave for drying herbs never used, I prefer what nejpřírodnějšímu manner. They are sufficiently dried herbs, so know that when creasing rustling, crumble into small pieces are fragile and break down or are easily rozemnout between your fingers, it depends on the type and the plant. If during drying herbs to dramatically turned brown turned black, it means that somewhere went wrong. They could mash bag unsuitable in the collection, or the result of a long delay between the accumulation and drying. The reason could be drying in wet conditions or in too thickly without conversion. Such herbs are impaired and are not suitable for storage and subsequent use. If we are satisfied with the result, the herbs are dried properly and have a healthy color, unnecessarily delay or prevent their entry, to take the dust again nezvlhly or into them with gusto not let any uninvited guest from the world of insects. Certainly most are airtight container for disposal. Ordinary screw jars and glasses are quite sufficient. If they are made ​​of transparent glass containers, it is better to place them in the darker parts of the room or at least away from direct sunlight. Some herbs should be stored in complete darkness. If we choose the store in paper or cloth bags, we can be sure that the room is really dry and not too warm. This method of storage but not the best. The long-term possibilities of air in bags of cloth or paper dried herbs gradually loses some of its active ingredients. Another drawback is the easy accessibility of pests, such as moths and various other home invaders, or softening and subsequent degradation mold. Herbs that are dried hanging in kytičkách we also had the first store in airtight container, otherwise get wet and deposited dust on them. Whether you opt for any method of storage room you choose to do should be dry, ventilated, clean and with the most stable temperature. The selected container is a good idea to name the herbs immediately, so we can avoid confusion and desperate sniff and examine the contents of undocumented glasses. How long to store dry herbs? Even with careful storage of dry herbal drugs due to gradual loss of active substances, it is optimal to keep that particular herb for one year, until the next harvest. Properly dried and stored herbs to sleep then just waiting for the time when we need them.